1. Strength of bleaching agent: Over the counter and dentist supervised at home products usually contain a lower strength bleaching agent. Usually, these products will have only 10 percent to 25 percent carbamide peroxide, which is the whitening agent, compared to 15 percent to 43 percent carbamide peroxide in whitening products professionally applied at the dental office. 2. Ill-fitting mouthpiece trays: Dentist supervised at home whitening trays are fabricated using an impression of your mouth. Each tray is custom made to fit your mouth exactly. 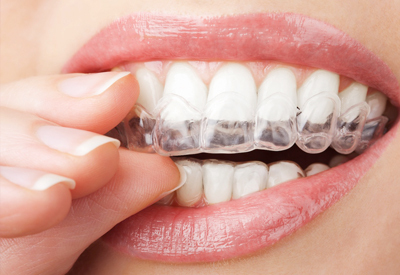 This customization allows the whitening gel maximum contact with your teeth. However, over the counter tray whiteners use a “one size fits all” approach. The trays are not designed to fit your mouth exactly. Too large or too small of a tray can cause gum and soft tissue irritation and the whitening gels may not whiten teeth evenly. 3. Additional Protective Measures: Some whitening products can be irritating to the gums and soft tissues. At home whitening treatments do not take measures to protect these tissues from irritation. When you chose teeth whitening by dentists, we will apply protective gels to the gums and soft tissues or use a special shield to protect your mouth from the effects of bleaching. 4. Best Treatment Plan: Over the counter whitening treatments are not designed to work for your specific needs. In a dental office, your dentist will perform a complete oral exam to determine if whitening is the best course of action for your cosmetic dentistry goals and which type of whitening treatment will best fix the discoloration of your teeth.